But, how do you know what question should be asked? 1. How do they charge? Fees can come in a variety of ways: per project, hourly, with retainers, etc. Find out how they will be charging and what those charges cover beforehand. There are many times in which the scope of a project is presented within certain parameters, but as the project advances, you, as the client, might have requests that add to that scope of work. Here is when extra fees can apply. The point here is to make sure that all parties involved are on the same page in terms of what is covered and what would be outside the scope of work and charged separately. As a client, you might want to know what kind of customers they have and what they have done for them. Does it relate somehow to what your looking for in terms of functionality, technology and user-experience? Have in mind that industry-specific experience is not necessarily something that will make your website a great website. It actually might hinder your possibilities of having a powerful solution because it might end up being a cookie-cutter product. Make sure you consider candidates with and without experience your field. 3. What type of web services do they provide and how do they measure their results? First of all, you need to set your own expectations so your new agency can manage them. Are you looking to have a website built from scratch or do you want a custom website, is it a simple informational website or does it include other complex components such as databases and e-commerce. Of course, this will be dictated by your objectives and somewhat by your budget, but it helps to know these type of "wants" from the very beginning. Have in mind that, if you're looking to have a website that sets you apart, a custom web design could be the difference between just having a website and having a website that you can use as a tool to build our brand. A powerful website should not only be visually pleasing, but also offer a great user experience and should also work as a tool to generate more business. Find out what kind of resources they have to be able to handle your project from start to finish. This will include technology and UX knowledge, systems integrations, etc. Finally, ask if their services include SEO. If not, make sure you find another partner who can help you optimize your site. I need to talk to a website design pro now! Show me how to do this! 4. How about changes to the website once everything is done? Whether you decide to go with a template or a custom site, your website should incorporate a user-friendly CMS (Content Management System). You won't be able to make major modifications to your site, but, at a minimum, you should be able to edit text and images. Depending on how involved you want to be, you can also add and create new pages, but make sure that you are very familiar with the CMS in order to do this. Normally, website design companies offer web maintenance, which can be very helpful when you don't have time to figure things out. 5. Will my new website be mobile-friendly? Mobile websites are becoming a thing of the past. A few years back, businesses would have a desktop website and a mobile website (m.site), but this proved to be a real hassle because any change that needed to be done, had to be completed on both sites. Not very practical! Well, Thank Goodness for responsive design! 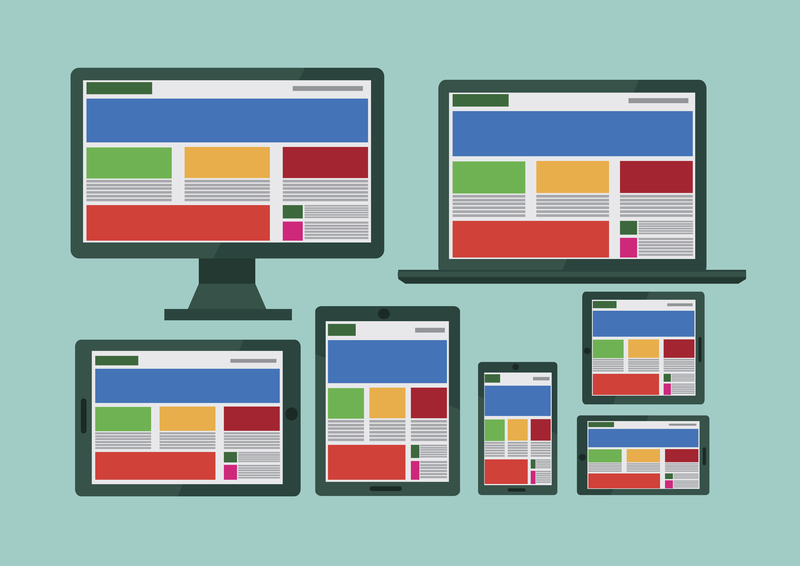 With responsive design there is no longer a need to have two separate websites. Responsive design allows you to have only one version of your website and, depending on the device, screen size and screen orientation, it will adjust the resolution, image size and scripting abilities. A good partner will consider all different approaches to make sure the final product results in a great user experience. Set realistic expectations for yourself and your website design partner. From how long it will take to complete the project (it might take 60 to 90 days to complete a website), to the type of technology and how it will affect the user experience. As a marketing and branding tool, a website is an investment of money and time. So make sure that it is done efficiently and effectively in order to avoid as many bumps as possible on the road. Are you ready to design or re-vamp your website? Contact us today! We'll make sure your new website is up to today's standards!